Unfortunately these quotes are not about the ACA (aka “Obamacare“). 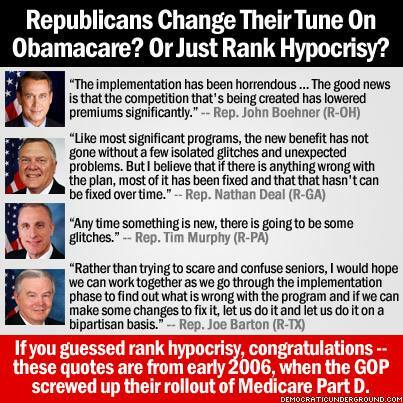 They are from early 2006 when the GOP screwed up their roll-out of Medicare Part D. Just goes to show that it all depends on which party the new bill is supported by and comes from. BTW… the grammatical error from Murphy’s statement is driving me insane! Should be, “… there ARE going to be some glitches.” He’s a Republican, I suppose poor grammar goes with the territory. Okay, I feel better now. Be care what you say, dear politicians, it might just come back and bite you in the a$$. It’s amazing how they could be so understanding of the problems of one giant rollout and so unforgiving about another. The thing is, politicians in this day and age speak only to their own party constituents and those folks will likely believe anything. I mean after all, they continue to elect these same buffoons. Americans’ memories are shorter than those of knats. Don’t be surprised that these comments would be totally discounted today, but weren’t in 2006. I certainly am not. But, let’s also be honest. There’s no way that the folks at the top should not have been totally aware of the debacle this ‘roll out’ has been way in advance and with enough time to remedy the situation before D Day. Heads should roll and not that of underlings. I watched Bill Mahr last night and thought what a pity that Anthony Weiner did America such a disservice by exhibiting his sexual failings. He was bright, articulate and a true spokesman of the Left with a brilliant mind that dashed the hopes of many by his own stupidity. A good point was made by Mahr about the sexual proclavities of other politicians who got away with their own indescretions and survived politically and still survive in some instances. lol… I just watched the last half of Bill Mahr and thought the same thing about Weiner. But he may be of more benefit now as there’s nothing to hold him back now. Not that there was much before, but they always have to wonder if something they do or say will get them kicked out of office. Now, no holds barred. Go for it Weiner!